This paper describes the processes and initial impacts of an action research project to strengthen the resilience of smallholders and simultaneously address environmental issues in Buol District, Indonesia. The remote and degraded landscape of Buol, located along the coastline of the Sulawesi Sea, while offering various livelihood options also makes farmers more vulnerable to environmental and socioeconomic changes. A low capacity to deal with frequently occurring extreme events, such as floods, droughts, and agricultural pests and diseases, as well as a lack of skills in increasing agricultural productivity, were the major problems facing the Buol smallholders. As a consequence, the Buol farmers only applied short-term strategies in managing their livelihoods. In addition, the capacity of the local government to respond and provide solutions to issues and challenges was limited. Under the Smart Tree-Invest project, ICRAF conducted a series of studies combined with pilot activities in the field to provide good practices for consolidating biophysical and socioeconomic information and on-the-ground actions to enhance resilience and provision of ecosystem services. This action research heralds that nested interventions on differing scales is essential, from the community to district level. At the community level, tree farming learning groups and participatory watershed monitoring were organized to increase farmers’ capacity in managing their landscape and to generate environmental and social data required for analyzing development impacts. At the district level, the establishment of a multi-sectoral government forum and a series of capacity building events to quantify and monitor ecosystem services were facilitated. These activities aimed to increase the capacity of the local government in planning green development by improving coordination among sectors and promoting application of co-investment principles between public-private sectors to maintain and enhance ecosystem services. Replication and upscaling of pilot activities funded by the district’s budget at the end of the pilot project were the key successes of the project, indicating raised awareness, ownership and trust, and proving that this type of action research can improve the livelihood capital of communities. Smallholder farmers in tropical countries are vulnerable to biophysical and socioeconomic shocks that intensely affect their livelihoods (Harvey et al. 2014; IFAD 2009), exacerbated by their lack of capacity to adapt to changes and inadequate access to the livelihood capital (natural, physical, financial, social, and human) needed to improve their resilience (Van Noordwijk et al. 2011). The inadequate capacity and insufficient access to capital of smallholders can be ameliorated by applying sustainable agriculture pathways. One option is management of multifunctional tree-based agriculture that both intensifies production and maintains the capacity of the agricultural landscape to provide ecosystem services (Jamnadass et al. 2011; Verchot et al. 2007). Studies show that landscape diagnostics with a multi-disciplinary approach are crucial in the initial decision-making phase of natural resource management. Correspondingly, this study under the “Climate-smart, Tree-based, Co-investment in Adaptation and Mitigation in Asia” (Smart Tree-Invest) project of the World Agroforestry Centre applied participatory and scientific research to clarify livelihood vulnerability on various scales and develop appropriate action plans. The goals of the action research study were to strengthen the resilience of smallholders, address environmental issues, and improve the provision of ecosystem services in the socio-ecological landscapes of Buol, Indonesia. 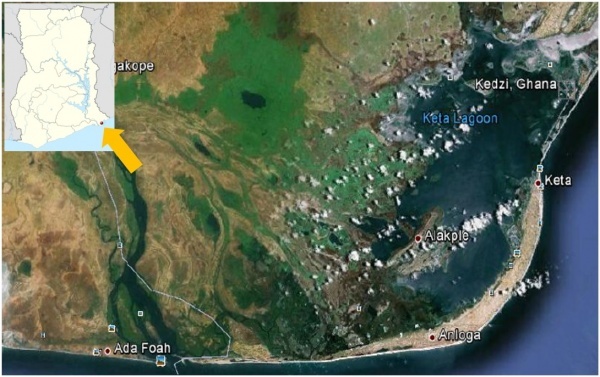 The project sites, located in upland and coastal landscapes, represent forest frontier areas that face the threat of conversion to monoculture cropping and plantations. This article consists of three main parts; the first part describes the context wherein environmental and livelihood issues in the area were explored using a vulnerability assessment framework. The second part presents the activities carried out towards enhancing livelihoods and improving the environment in the degraded landscapes of Buol. The third part elaborates on the initial impacts of activities, assessed from the perspective of the five types of livelihood capital. The Smart Tree-Invest project was coordinated by the World Agroforestry Centre (ICRAF) from 2014 to March 2017. The project aimed to develop co-investment schemes through tree-based agriculture to improve the resilience of smallholders and the provision of ecosystem services. Trees can provide livelihood benefits for smallholders that can help them to adapt to the changing climate and the socioeconomic and political situations that influence their resilience. Trees also provide ecosystem services, such as water regulation, disaster prevention, and carbon stocks, which benefit external actors. The term co-investment in landscape stewardship (CIS) evolved from the concept of payment for ecosystem services (PES). Instead of focusing on a market-based principle (ES buyer-seller) like in PES, CIS emphasizes co-management principles whereby all actors contribute and co-invest in the provision of ecosystem services (Leimona et al. 2015). The co-investment scheme is designed to link the positive environmental impacts from smallholders’ tree-based agricultural activities to rewards and incentives from external ecosystem services beneficiaries to create sustainable livelihoods (Figure 1). During the initial stages, a scoping phase was carried out to comprehend the context of the landscape, particularly issues of vulnerability, and to identify potential actions to improve smallholder resiliency. Subsequently, pilot activities for the co-investment scheme were initiated, and best practices generated from the interventions were shared with policy-makers. Smart Tree-Invest applied a landscape approach, in which the project sites were perceived as clusters or landscapes that share similar socio-ecological traits, such as biophysical (i.e. farming systems, land cover, tree diversity) and socioeconomic (e.g. wealth status, ethnicity) characteristics. 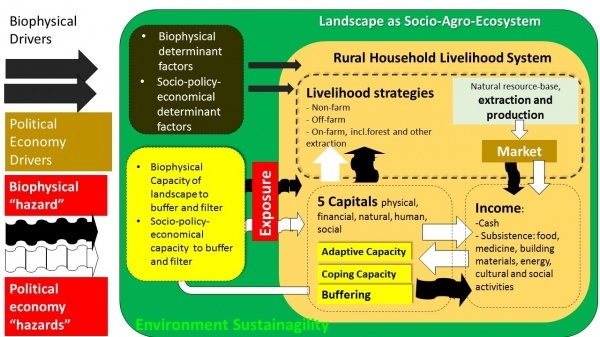 For the landscape diagnostic, the project applied the Capacity Strengthening Approach to Vulnerability Assessment (CaSAVA, see Figure 2) framework that integrates biophysical and socioeconomic quantitative research with a participatory approach (Dewi et al. 2013). The diagnostic study consisted of a series of analyses on land use and land cover change, the quantification of ecosystem services (such as tree diversity and carbon stocks) (for results, please see Rahayu et al. 2015 and Wijaya et al. 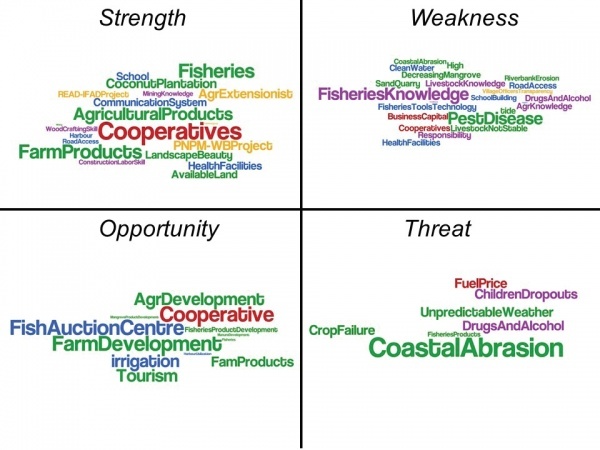 2015), and assessment of smallholder vulnerability related to socioeconomic characteristics, using both Shock, Exposure, Response, and Impact (SERI) analysis, and Strength, Weakness, Opportunity, and Threat (SWOT) analysis. The vulnerability assessment was carried out through a series of household surveys and group discussions with smallholders in the project site (Amaruzaman and Lusiana 2017). Group discussions were focused on SERI analysis of four aspects: land use, water resources, farming systems and biodiversity. Likewise, SWOT analysis focused on five types of livelihood capital. Impacts were mainly assessed through discussions and observations with stakeholders in the project site. The Buol District lies in the northern part of Sulawesi Island, on the border of Central Sulawesi Province. With a total area of 4,040 km2, Buol is one of the poorest districts in the province. Due to its remote location and limited transportation options, Buol has low access to markets. Its landscape consists of upland forest in the south, agroforest and oil palm plantations in the centre, and cropland and settlements in the northern lowlands. A mangrove ecosystem lies in the northern areas along the coastline. The study site was divided into three landscape clusters: (1) upstream watershed (2) midstream watershed, and (3) coastal landscapes (Figure 3). Agriculture is the main livelihood, with cacao, coconut, cloves, coffee, rice and seasonal crops as the main commodities. The majority of households have multiple livelihood options to complement their farming activities, such as working on the plantation, or in mining, coastal fisheries and government offices. Spatial analysis for the period of 1996 to 2014 showed that forest, comprised of both protected and degraded forests, was the most dominant land cover type in Buol, followed by various mixed systems (agroforestry) [In Indonesia, it is common to find smallholders growing commodity tree crops in a mixed system called agroforestry. Agroforestry combines perennial cash crops with timber, fruit, food crops, building and handicraft material and medicinal plants, and has socio-cultural value for the local community (Joshi et al. 2002)] of cacao, coconut, fruit trees, and rice fields (Figure 4b). 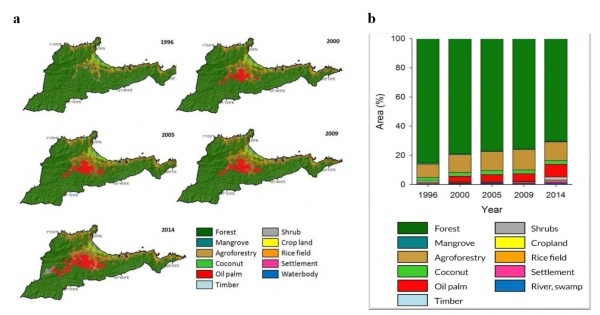 The major change during this time period was from forest to agroforest, and from forest and agroforest to oil palm plantation (8% and 6% of total district area, respectively), indicating the increasing pressure on forest and tree-based agriculture to shift towards monoculture systems (Tanika et al. 2015). The upstream cluster is on the boundary with the oil palm plantation and protected forest, thus many farmers do labour on the plantation. The majority of upland residents cultivate rice and annual crops, with better results in the midstream cluster due to the availability of technical irrigation. Most coastal farmers cultivate tree crops while enjoying more varied livelihood options compared to the two upland clusters, such as fisheries and mining (Table 1). Rice and annual crops are more dominant in the upstream and midstream clusters, while tree crops (clove, cacao, and coconut) are the major farming commodity in the coastal cluster (Figure 5). The average annual income in three clusters ranges from 3,350 to 4,530 USD. The average per capita daily income in each cluster is slightly above the global poverty standard of USD 1.9 per day[i] (Table 2) [The global poverty standards published by the World Bank: http://www.worldbank.org/en/topic/poverty/brief/global-poverty-line-faq, accessed on 20 June 2017]. Farming sectors contributed to more than 50% of household income (Figure 5) with substantial contribution from non-farm activities such as plantation labour, mining, small businesses, and government office employment. Floods, agricultural pests and disease, and drought are the main biophysical shocks experienced by smallholders, associated with land use changes in the landscapes. Socioeconomic shocks that impact farmers’ livelihoods consist of increasing food prices, scarcity of fertilizers, and fluctuation of agricultural product prices. The majority of farmers are aware of ideal responses that can buffer the shocks. However, not many are able to perform these responses due to lack of knowledge and funds. Knowledge on the types of livelihood capital that communities, including the village government, considered to be their strengths, weaknesses, threats and opportunities was helpful in better shaping the recommended co-investment activities to enhance the communities’ livelihoods and address their vulnerability. The SWOT analysis shows that all clusters perceived natural capital as their dominant strength and opportunity. Infrastructure, human, and financial capital dominated areas of weakness and threats (Figure 6). The scoping phase identified several prerequisite interventions at the community, landscape, and district levels that were required for developing the co-investment schemes to improve the livelihoods of smallholders and ecosystem services in Buol. SERI and SWOT analysis indicated that smallholders in Buol are vulnerable to biophysical shocks such as flood and drought. Limited financial capital, as reflected in household income, forced smallholders to apply short-term strategies in managing their farms, such as changing farm commodities or doing non-farming casual work. Lack of knowledge to cope with the shocks made them perceive infrastructure as the main solution to their environmental problems. 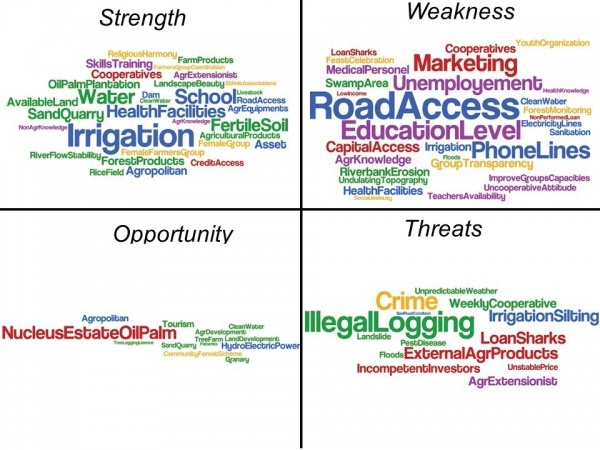 SWOT analysis revealed that the smallholders have only limited capacity in agricultural management, particularly in tree-based agriculture systems. However, the potential to develop tree-based agriculture in these clusters existed. This situation reflects the need for capacity building in tree-based agriculture for smallholders as a long-term strategy to improve their income and maintain the quality of their environment. At the watershed level, reliable data to support the clarification of environmental problems were not available. The analysis also indicated the lack of capacity of the district government and local community to monitor and manage their landscapes. This situation also calls for capacity building and awareness raising on the monitoring of ecosystem services to enable stakeholders to acquire reliable data to sustainably manage the landscape. At the district level, a multi-sectoral approach was required to facilitate the co-investment schemes. A coordinating body at the district level was expected to change the sector-focused action mind-set of government officers and improve cross-sectoral coordination. A series of capacity building activities was required to improve the knowledge and skills of local officers to enable them to support the co-investment schemes. Table 4 summarizes the recommendations for pilot activities in the co-investment scheme in Buol. 3 Improve the capacity of the local government to act as an intermediary in developing co-investment schemes, including the capacity to design new co-investment programmes, recognize opportunities to link between conservation and development efforts, continuously facilitate monitoring of the landscape’s ecosystem services by smallholders – Capacity building on designing and implementing ecosystem services monitoring system. – Innovative mind-set and skills to design green agriculture programme. The scoping phase identified an absence of direct beneficiaries in the private sector in Buol that were capable of providing financial incentives for the smallholders; thus, the co-investment scheme required co-investors from the domain of public development. Within the remaining period of the project, the Smart Tree-Invest team mainly provided enabling activities to prepare the stakeholders for development of their co-investment schemes (Lusiana et al. 2015). Activities consisted of capacity building and awareness raising to improve livelihoods and ecosystem services management on the part of smallholders at the community, landscape, and district levels. The project established learning groups in eight village sites [see Hendrawan, DC 2016, ‘Growing Hope with Trees’ for further information about the learning groups], aimed at improving the capacity of local smallholders and empowering them in tree farm management. Through the learning groups, the members were trained to improve land productivity with better farming techniques, and to produce their own tree seedlings, organic fertilizers, and organic pesticides. The learning groups were designed to be participative and self-reliant. Membership is voluntary, and the pace of learning depended on the active participation of members. Group members selected their preferred commodities and contributed financially and socially—or co-invested—by providing their time and labour to construct learning plots and nurseries. Group members contributed materials and tools for group activities, and the project also contributed materials that are difficult for farmers to provide (i.e. nursery nets, germplasm). The project initiated participatory watershed monitoring that consisted of measurement of rainfall, water discharge and water turbidity by the local community. The participatory hydrological monitoring aimed to generate hydrological data for watershed assessment, increase community awareness on their watershed landscape, and increase the capacity of local communities to monitor their landscapes (Tanika and Lusiana 2016). Smart Tree-Invest facilitated the establishment of a cross-sectoral coordinating body called the Watershed Working Group in Buol District [See Amaruzaman, S 2015, ‘Stronger collaboration for co-investment in ecosystem services’, for further information about the District Watershed Working Group]. The Working Group consists of representatives from the district’s Planning Agency, Agricultural Office, Environmental Office, Village Empowerment Office, Forest Office, and Public Works Office. The establishment of the Working Group aimed to improve cross-sectoral coordination in watershed management and support the facilitation of co-investment in ecosystem services in Buol. Capacity building for government officers [See Tanika, L 2016, ‘Training of trainers in monitoring and evaluating tree-growth and watershed functions in Buol, Indonesia’, for further information about the training] was focused on two main aspects: ecosystem services enhancement and tree farm management, targeting the Watershed Working Group and rural advisory (extension) officers respectively. Representatives from the oil palm plantation also joined these trainings. The learning groups have empowered smallholders to be less dependent on support from the district government in managing their tree-based agricultural activities. Post-project interviews revealed that the majority of group members have applied tree nursery development and management techniques acquired in the learning groups on their own lands. Currently, the smallholders do not have to wait for seedlings or fertilizer support from the government. Acquired knowledge in producing organic fertilizer has encouraged learning group members to cage their livestock for fertilizer material, which has gradually changed the behaviours of villagers in the project sites that used to let their livestock roam free on public roads and agricultural land. The participatory watershed monitoring only involved a limited number of villagers in conducting the monitoring. However, the initial results were conferred to a wider range of village communities through a role-playing game (Tanika et al. 2016). After the game was played, changes in watershed conditions were discussed and participants from the villages were asked to reflect on their experiences in the game and their daily activities. Thus, the participants were able to identify more risk and exposure to hydrological issues, and have wider mitigation options and coping strategies. The trainings on ecosystem services have improved the understanding of government officers on the concept of ecosystem services derived from a production landscape, how to monitor the ecosystem services from the landscape, and methods for facilitating smallholder learning groups. The Watershed Working Group provided the arena for local policy-makers to improve multi-sectoral development coordination, engage in better-informed planning, and increase the synergy between economic development and environmental conservation in the district. Realizing the potential of the Smart Tree-Invest approach, the Working Group not only endorsed its replication within the district government, but also facilitated meetings with the private sector, such as the oil palm plantation, to replicate the project approach. After joining in trainings on ecosystem services, representative of the oil palm company realized that they also can contribute to environmental conservation. Even though the oil palm company is not the direct beneficiary of the watershed services, representatives were willing to carry out environmental monitoring in their plantation area within the watershed. Facilitated by the Watershed Working Group, in March 2017, the company replicated hydrological and tree-growth monitoring as a part of the company’s CSR. The plantation will carry out the monitoring and periodically share the data with the Watershed Working Group. This initiative can be considered to be an initial co-investment from the company in environmental stewardship. At the end of project, learning group members voluntarily planted approximately 4,500 cacao, durian and nutmeg tree seedlings on their private and degraded lands. Replication by the district government is expected to engage more stakeholders in tree-based farming and planting of more trees. Tree-planting will improve ecosystem services, such as carbon sequestration and watershed health, through the expansion of tree-based agricultural lands in the district. Watershed monitoring replication by the district government has gradually improved multi-sectoral development planning in the district. Better informed and integrated planning is expected to improve environmental conditions in the district, particularly on the watershed scale. The results of tree farm learning groups could potentially increase smallholder income through better productivity based on improved tree farming management. Moreover, new skills in seedling and organic fertilizer production have brought additional income opportunities for learning group members. The learning groups from five villages were already requested by their neighbours to sell the seedlings and fertilizers they produced. In the project closing workshop held in April 2017, Buol District’s Chief of Agricultural Office stated that he will allocate district funds in 2018 for buying seedlings from the learning group members if they can provide the required seedling quality. In the upland clusters, we observed an increase in the price of degraded lands (sale and rent), due to increasing demand to plant trees on the degraded lands from the learning group members. Further impacts on financial capital are related to the public development fund. In 2017, the Buol government allocated 38,400 USD from the District Development Budget to replicate several Smart Tree-Invest activities (Table 5). Further, three village governments in the project sites stated that they have allocated village funds [The Act No.6/2014 has given more authority to village governments, including management of village development funds. To appropriately utilize the funds, village governments’ capacity in development planning needs to be improved, including in environmental conservation and local agricultural development] for agricultural activities, based on the knowledge acquired from the learning groups. These replications using public development funds indicate the awareness and willingness of the local government to co-invest in environmental stewardship. Another potential impact that could enhance the livelihoods of smallholders is the provision of link between the commodities cultivated by the smallholders with the market, which would improve the benefits and sustainability of the smallholders’ farming practices. Due to time limitation, this activity was not implemented during the project period. The participatory watershed monitoring brought opportunities for smallholders and district officers to improve their understanding of the landscape. A better understanding of the landscape will enable stakeholders to make decisions on land-based solutions, such as tree planting, as a way to cope with environmental issues. Furthermore, their dependency on infrastructure construction to solve environmental issues will be reduced. However, consistency in conducting watershed monitoring is required from the stakeholders to generate reliable data for well-informed decision-making. The learning groups required smallholders to work together. At the end of project, four learning groups stated that they will continue to collaborate and work together as a group, indicating the growing bonds between the members. In applying the project approach, both for the learning groups and watershed monitoring, district officers must go to the field and interact with communities. This intensified interaction will potentially increase trust and collaboration between the government and the communities. This study has presented the experience of the Smart Tree-Invest action research project on improving smallholder resilience and ecosystem services provision through co-investment schemes. Results show that a landscape diagnostic with a multi-disciplinary approach is a crucial phase in natural resource management. A comprehensive understanding of the vulnerability context in Buol, Indonesia, was built through the application of the CaSAVA research framework that combines scientific research (i.e. spatial analysis and assessment of ecosystem services) with a participatory approach to examine the local knowledge. Building upon diagnostic results, specific on-the-ground interventions were designed to strengthen various types of livelihood capital to help improve the resilience of smallholders and ecosystem services in the landscapes. Tree farm management and watershed monitoring curricula were developed for the smallholders in the coastal and watershed clusters to improve their capacity in managing tree farms and watershed landscapes. At the district level, the project facilitated capacity building and advocacy targeted at local development actors, such as representatives of the local government and private sector. These activities further promoted the application of co-investment principles between public-private sectors with the smallholders to maintain and enhance ecosystem services. Observations at the end of project revealed that initial improvements in the five types of livelihood capital have taken place. Replication and upscaling of the pilot funded by the district’s budget at the end of the pilot project represent the key successes of the project and indicate raised awareness, ownership and trust, proving that this type of action research can improve the livelihood capital of communities. The Smart Tree-Invest project was implemented with funding support from the International Fund for Agricultural Development (IFAD) and the Forest, Tree, and Agroforestry (FTA-3) Program of CGIAR. We thank all of the partners and the project participants in the Buol District for their contribution and enthusiasm in supporting the project implementation. Dewi, S., Khasanah, N. M. & Widayati, A. 2013. Capacity-strengthening approach to vulnerability assessment (CaSAVA). In: Van Noordwijk, M., Lusiana, B., Leimona, B., Dewi, S. & Wulandari, D. (eds.) Negotiation-support toolkit for learning landscapes. Bogor, Indonesia: World Agroforestry Centre (ICRAF) Southeast Asia Regional Program. Harvey, C. A., Rakotobe, Z. L., Rao, N. S., Dave, R., Razafimahatratra, H., Rabarijohn, R. H., Rajaofara, H. & Mackinnon, J. L. 2014. Extreme vulnerability of smallholder farmers to agricultural risks and climate change in Madagascar. Philosophical Transactions of the Royal Society B: Biological Sciences, 369. IFAD 2009. Climate change impacts in the Asia/Pacific Region. Rome: The Global Mechanism: United Nations Convention to Combat Desertification and International Fund for Agricultural Development. Jamnadass, R., Gebrekirstos, A., Neufeldt, H., Muthuri, C., Dawson, I., Kindt, R., Nyberg, Y., Dietz, J., Bayala, J., Kuyah, S., Ong, C., Montes, C., Weber, J., Hairiah, K. & Van Noordwijk, M. 2011. Trees as providers of environmental services in multifunctional landscapes are vulnerable to climate change. In: Van Noordwijk, M., Hoang, M., Neufeldt, H., Oborn, I. & Yatich, T. (eds.) How trees and people can co-adapt to climate change: reducing vulnerability through multifunctional agroforestry landscapes. . Nairobi: World Agroforestry Centre (ICRAF). Joshi, L., Wibawa, G., Vincent, G., Boutin, D., Akiefnawati, R., Manurung, G., Van Noordwijk, M. & Williams, S. 2002. Jungle Rubber: A Traditional Agroforestry System Under Pressure, Bogor, Indonesia, World Agroforestry Centre Southeast Asia Regional Office. Leimona, B., Van Noordwijk, M., De Groot, R. & Leemans, R. 2015. Fairly Efficient, Efficiently Fair: Lessons From Designing and Testing Payment Schemes for Ecosystem Services in Asia. Ecosystem Services 12, 16-28. Lusiana, B., Tanika, L., Amaruzaman, S. & Leimona, B. 2015. Potential and challenges in developing co-investment for ecosystem services schemes in Buol district, Indonesia. Working Paper. Bogor, Indonesia: World Agroforestry Centre (ICRAF) Southeast Asia Regional Progr. Tanika, L. & Lusiana, B. 2016. Simple monitoring tools for watershed assessment at Buol watershed, Central Sulawesi, Indonesia [Online]. Bogor, Indonesia. Available: http://old.icraf.org/regions/southeast_asia/publications?do=view_pub_detail&pub_no=PO0387-16 [Accessed on 20 June 2017]. Tanika, L., Lusiana, B., Amaruzaman, S., Rahayu, S., Dwiyanti, E., Wijaya, C. & Wibisono, I. 2015. Smart Tree-Invest Indonesia Site Cluster Profile. In: Amaruzaman, S., Leimona, B., Dewi, S., Lusiana, B., Catacutan, D. & Lasco, R. (eds.) Cluster Profile Climate-Smart, Tree-Based, Co-investment in Adaptation and Mitigation in Asia (SMART TREE-INVEST) Project. Bogor, Indonesia: World Agroforestry Centre (ICRAF) Southeast Asia Program. Tanika, L., Lusiana, B. & Leimona, B. 2016. Collaborative watesrhed management for enhancing watershed function. In: CENTRE, W. A. (ed.). Bogor, Indonesia: World Agroforestry Centre (ICRAF) Southeast Asia Regional Program. Van Noordwijk, M., Hoang, M., Neufeldt, H., Oborn, I. & Yatich, T. 2011. How trees and people can co-adapt to climate change: reducing vulnerability through multifunctional agroforestry landscapes, Nairobi, World Agroforestry Centre (ICRAF). Verchot, L., Van Noordwijk, M., Kandji, S., Tomich, T., Ong, C., Albrecht, A., Mackensen, J., Bantilan, C., Anupama, K. & Palm, C. 2007. Climate change: linking adaptation and mitigation through agroforestry. Mitigation and Adaptation Strategies for Global Change 12, 901–918.